All told, 87,950,807 individual cases were entered into their database, including location, time, and diseases. Not fun, however it was done. If you look along the top of this heatmap, you can see a series of spikes. These spikes represent incidence of disease per 100,000 people. The data exists in spikes due to the seasonal nature of the disease; each spike corresponds to a year. You can also see the years labeled along the bottom of the heatmap. 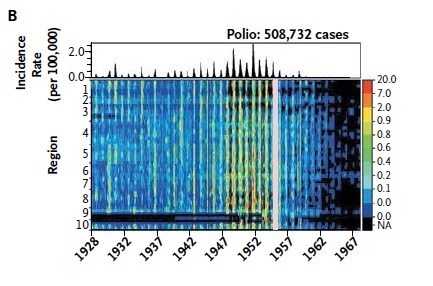 The first polio vaccine was introduced in 1955, and the live attenuated version in 1961 and the data clearly show that the incidence rate drops sharply after these vaccines come into use. Data for the other diseases are similar. Modeling different assumptions, the researchers project that between 72 and 148 million cases of these diseases were prevented since 1924. And that’s remarkable. Let’s remember that some of these diseases can be fatal and so the numbers represent not just prevented illnesses but also a substantial number of prevented deaths. However, all isn’t roses and lollipops. In their dataset they also have seen a recent rise in the incidence of Measles, mumps, rubella and pertussis. Pertussis has actually been increasing in incidence slowly but surely since 1976. The authors make the conjecture that this is related to the increase in parents choosing not to vaccinate their children, leading to local loss of herd immunity. In support they note that in the 1980s 64% of the kids diagnosed with pertussis had either never received the pertussis vaccine or had only received some of the recommended shots. While this research will likely do no better than other studies in convincing the anti-vaccine crowd of the benefits of vaccination, it’s still an indictment of the mindset that leads to parents keeping their kids out of the recommended vaccine regimen. The other point of this study I’ll end on is just an observation about how simply collecting and looking at large datasets can be fascinating and important–the transformation of quantity into qualitative insights and discoveries. The researchers named their effort “Project Tycho” after the Danish astronomer Tycho Brahe, who was named after the crater on the moon and who had a prosthetic nose (first part false, second true. Really). Brahe’s large dataset was used by Kepler later to find patterns in the movement of planets. Another reminder that we’re surrounded by data, accumulating more all the time, and sometimes the most useful thing to do is just take a look. This entry was posted in Big Data, Biology, Civic Development, Knowns and Unknowns, Networks and Systems, Public Health and tagged diphtheria, epidemiology, hepatitis A, measles, mumps, Pertussis, polio, public health, rubella, smallpox, vaccines, whooping cough. Bookmark the permalink. Interestingly, vaccination policy is also a big deal in Europe nowadays. I recently heard a talk at Uni Zurich, where they were showing that vaccination is of course useful and necessary, but you can make vaccination efforts more nuanced: vaccinating more or less people depending on how mobile people are/how much contact they have with other people. Hi Uschi, thanks for your comment. That’s interesting to hear about the debate in another part of the world. I’ve been reading some about behavioral economics theories and choice architecture and optimizing environments to make our day to day lives run smoother and jibe more effectively with public policy. I just read a paper in PLOSOne that I’ll be writing up soon about choice architecture and the affordable care act in the US. Not to sound too pollyanna-ish, but I think we’re in a great time to try to meld technology, behavioral psychology and policy in ways that really help people in a lot of ways.